Finally, if you have a Michigan ancestor who died between the years 1921-1952, you can search online for the death record index at Family Search. This long awaited collection is index only, no images, at this time, but anything is a welcome addition to Michigan records. I used my Roots Magic genealogy software program to print a custom list for my 1921-1952 deaths in my family tree. I am now ready to put aside my work for the day and search for dead people. My first search was met with this error message, "We are unable to display search results due to technical difficulties. Please try searching again in a few minutes." I have a feeling I am not the only one who discovered that these records are online. I will keep trying, even if I have to stay up late to do so. The Glover House can be found at 118 S. Washington St., Ypsilanti, Michigan. The 3900 square foot home is listed on the Michigan State Register of Historic Sites. Charles W. Glover, son of Henry Pierce Strong Glover and Nancy Jane Kishler, is credited with building the home in 1893. 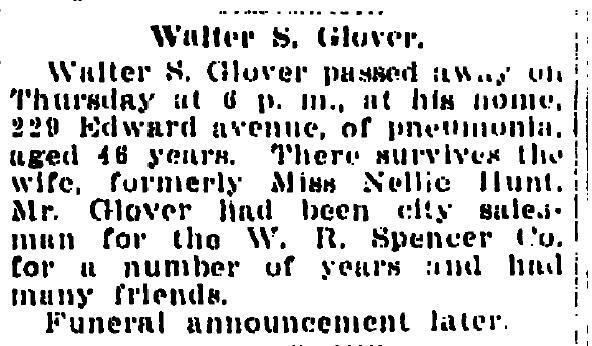 Henry Pierce Strong Glover is my first cousin, four times removed and I am researching him because his mother, Mary Ann Powers Glover and my third great grandmother, Vinera Powers Glover, were sisters. Their husbands, Charles W. Glover and Samuel Stillman Glover were brothers. I am trying to determine the maiden name of Mary Ann and Vinera's mother, Lucy. My research led me to Ypsilanti, Michigan and the Glover House. Henry Pierce Strong Glover was a well-known personality in Ypsilanti. He was mayor of Ypsilanti in 1892-93. Henry died at the Glover House on 21 February 1912. Today, the home is a private residence that is being restored. Since I can't claim it as my own, I would love to see the inside of this home and walk in the steps of my ancestors. 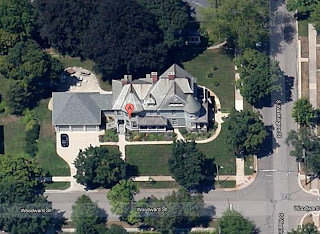 The Glover House as seen from google maps. Tuesday was a cold, dreary Michigan morning. I had just returned from the doctor's office and had been told to rest and drink plenty of fluids. I had woken up with a sore throat and was scheduled for minor surgery the next day. I did not want to have to reschedule my surgery so I was being a good patient. I made myself a hot chai tea and sat down with my laptop to rest. I was looking through Facebook and saw Heather Rojo's post thanking Thomas(MacEntee) for the links to an article and thanking Family Tree Magazine for choosing her blog. (Nutfield Genealogy). I left a comment for Heather and immediately went to check it out. I was excited for Heather and thought it was cool that one of my facebook friends was included on the list. I was scrolling down the list of best bloggers and impressed with how many of the blogs I follow. 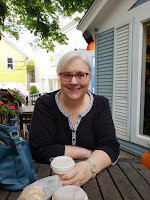 I started reading the Good Advice Awardees: The Armchair Genealogist, Dear Myrtle, Gena-Musings, Genealogy Tip of the Day, Hidden Genealogy, Midwestern Microhistory and Olive Tree Genealogy. Yep, I regularly read all of those. Next, was Mississippi Memories-ooh I found a new blog to follow! The last category was Story Time. I am scrolling down the list and ... wait, Journey to the Past! That is my blog, I think. I read the snippet and there in black and white is my name. OMG! My blog was included. I am in shock. After I calmed down from the shock, I felt fortunate to be included with such a great group of bloggers. Sometimes, as I sit and write my blog in little ole Battle Creek, Michigan, I wonder if anyone is reading what I write. I guess they are. 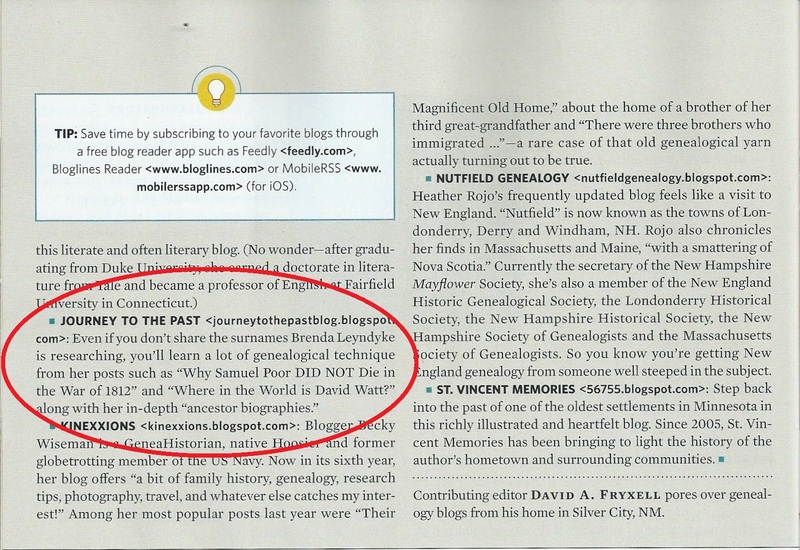 Thank you Family Tree Magazine for including "Journey to the Past" in your 2013 selection. I am truly honored. I can relate to the words of David A. Fryxell, when he writes about "stick-to-itiveness". I, too, struggle with finding the balance between writing and researching. For me, it is important to write about my research. I have gotten more than I ever thought imaginable from blogging. I have met wonderful bloggers. It is always fun to be contacted by readers who would like to know more about something I have written and being able to help them. I didn't think anything could replace the feeling of receiving my great grandmother's Bible or my great grandparent's wedding pictures, but when I met a Glover cousin and a Fredrick cousin, I was overwhelmed. All of this because of sharing my research through blogging. 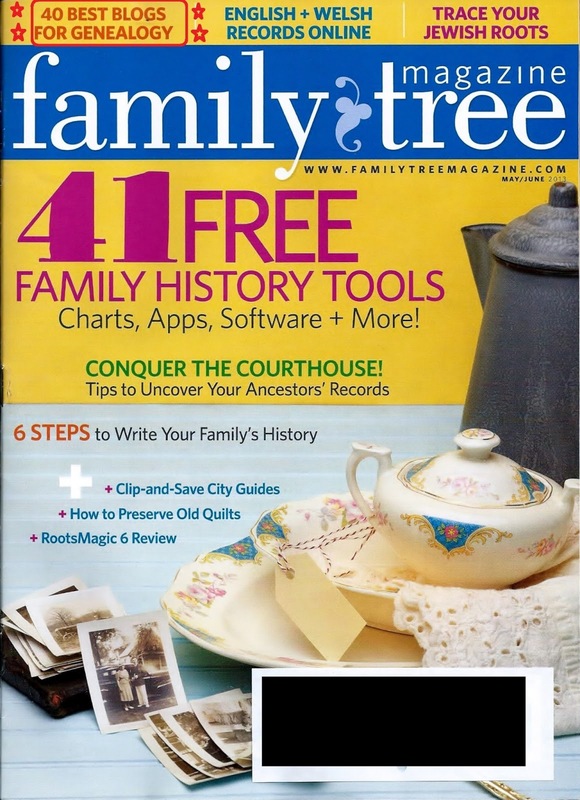 Family Tree Magazine Cover, May/June 2013 Issue. Published by F+W Media, Inc., Cincinnati, Ohio. 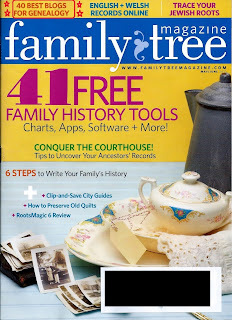 I was recovering at home when I received my copy of this month's Family Tree Magazine. I flipped to page 27 and read the article, "Hot Blog" and smiled again when I saw my blog listed. I was selected in the Story Time category, "Making one's family tree interesting to those not hanging from its' branches is a feat for a genealogy writer. The family tales of these bloggers engage us with words and images, and offer useful bits of research wisdom" say David A. Fryxell in his article, "Hot Blog". Below, is what was written about Journey to the Past. 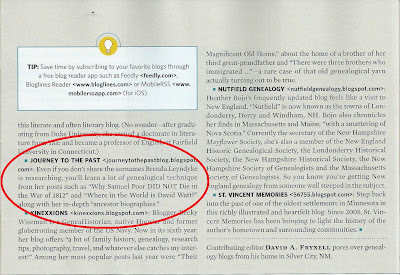 Congratulations to all the bloggers who contribute their individual talents to the genealogy blogging world. You make researching easier and fun with all your tips and topics. I am honored to be included in this year's group. 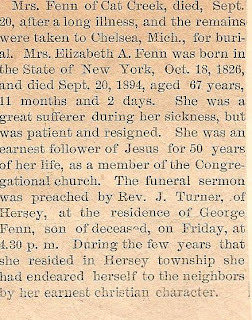 Elizabeth Poor Fenn "endured herself to her neighbors by her earnest Christian character" as her obituary states. Religion was a large part of her sixty seven years. She was a member of the Congregational Church for over 50 years. Elizabeth's christian life began on 18 October 1826 in New York, United States, possibly Steuben County. She was the oldest daughter born to Samuel B. Poor and Eleanor Begole. She grew up with ten brothers and sisters: Jane, George B., Hannah, Samuel, William, David M., Evan J., Matilda, Harlan and Ellinor. 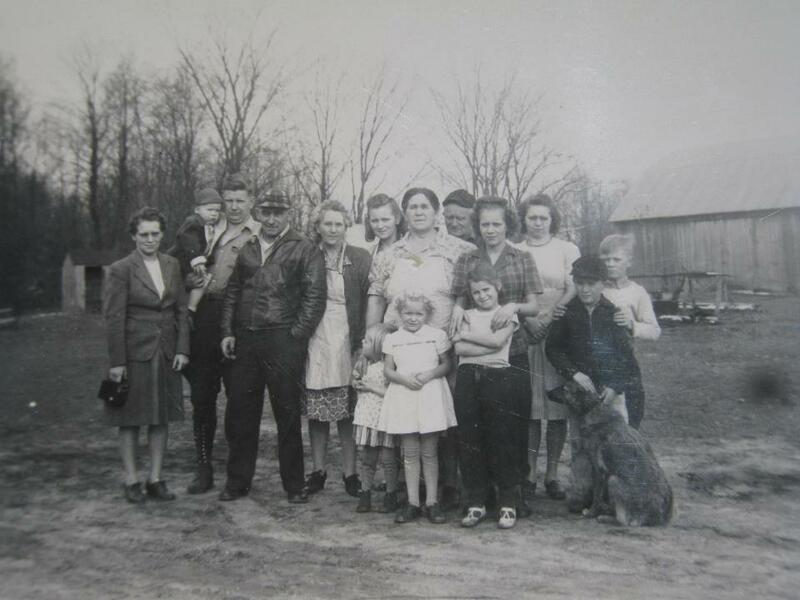 Elizabeth's family migrated to the Washtenaw County, Michigan area by 1840. Did they travel by the Erie Canal or by wagon and horses? Either way, travelling with her young siblings had to be a challenge. I don't know for sure, but I bet prayer was needed to make the long trip to a new home. They lived an agricultural life in the early years of Michigan statehood, settling in the Sylvan Township area of Washtenaw county. 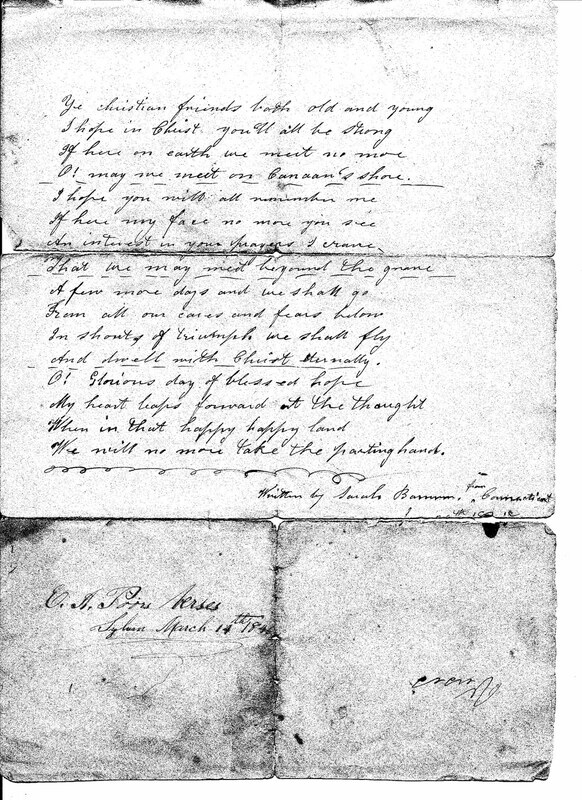 The role of religion in her life was evident by 1846, based on the Parting Hymn that I found in her daughter Hattie's Bible. The fact that the handwritten verses were saved all these years makes it important. Elizabeth would need to rely on her faith to get through the year 1848. 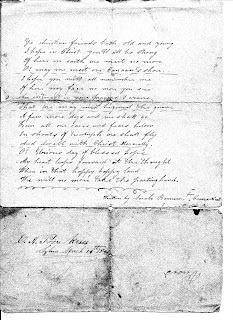 First, her sister, Jane E. died in April of 1848 and less than four weeks later, her mother, Eleanor Begole Poor died. It is during this time that Elizabeth marries. 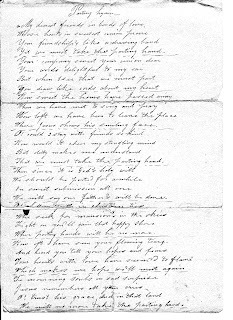 Elizabeth Ann Poor married her sister's(Jane), husband, Daniel C. Fenn. She became an instant mother to Daniel and Jane's infant daughter, Estelle. Daniel, Elizabeth, and Estelle spent their early time together in Sylvan Township, Washtenaw, Michigan. It is here that Daniel and Elizabeth started their own family. Zalton M. Fenn was born in 1850. He would be joined by three other siblings who lived to adult: Tully Daniel, born 1859, George 1860 and Hattie in 1864. Elizabeth would be required to move at least three times in the next thirty years. 1860 finds Elizabeth living in Sharon Township, Washtenaw, Michigan. 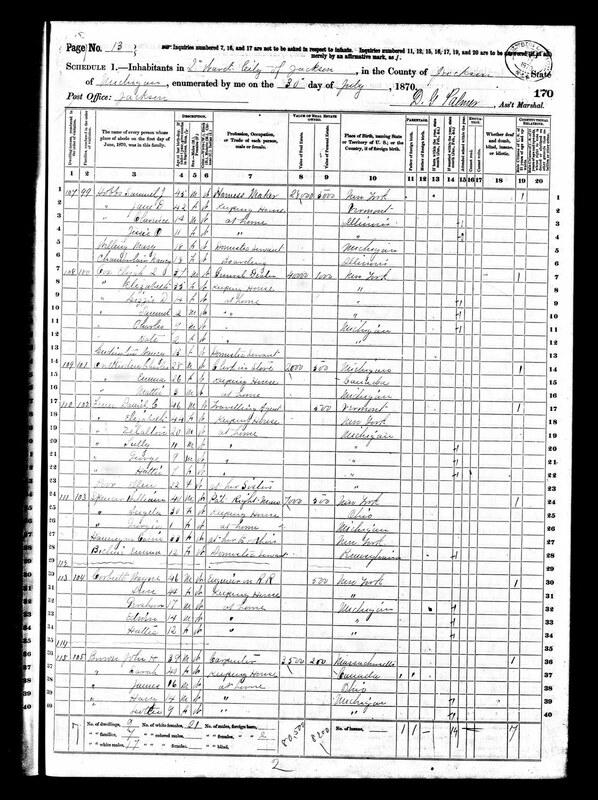 The 1870 United States Census has Elizabeth living in Jackson, Jackson, Michigan, with Daniel, Zalton, Tully, George, Hattie and Elizabeth's sister, Ellen (Ellinor). 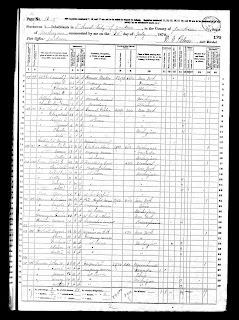 Source: 1870 U.S. Census, , population schedule, Ward 2, p170A, dwelling 110, Elizabeth Fenn; digital images, ancestry.com (: accessed 27 October 2011); Original data: 1870. United States. Ninth Census of the United States, 1870. Washington, D.C. National Archives and Records Administration. M593, RG29, 1,761 rolls. 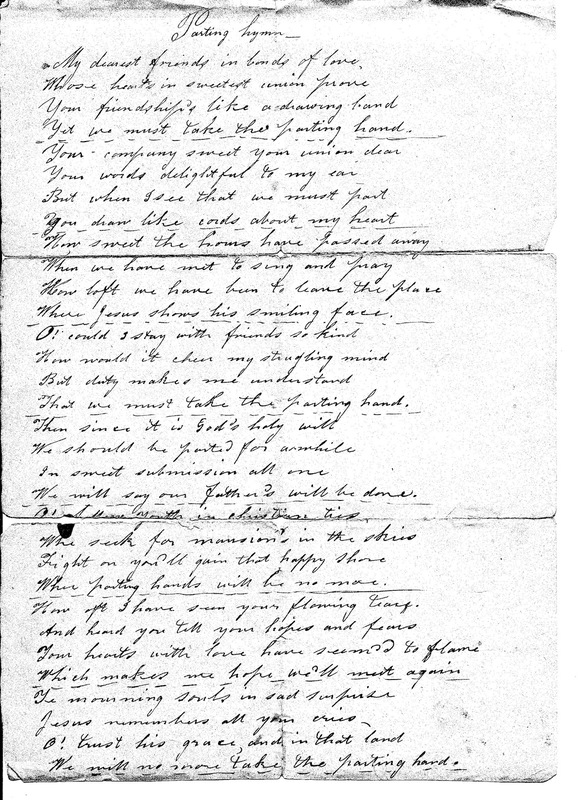 Elizabeth's husband, Daniel C. Fenn, died in February 1873 and Elizabeth eventually moves to Chelsea, Washtenaw, Michigan. Elizabeth spends her last few years of her life in Hersey, Osceola, Michigan, where her son, George, lived. Elizabeth's life ends on 20 Sep 1894 in Hersey, Osceola, Michigan. 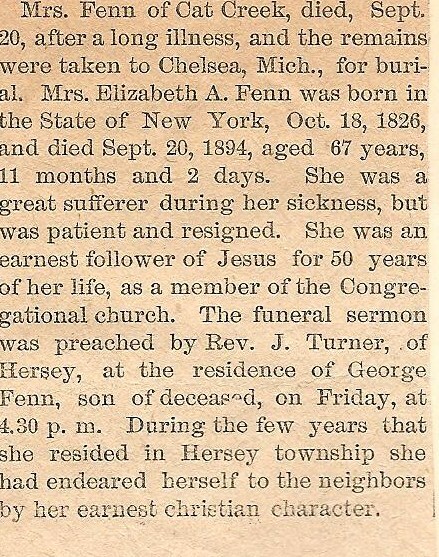 Her obituary shows the christian life that she led. Source: Glover, Hattie L. "Fenn", Elizabeth Fenn obituary. In The Holy Bible: with Revised New Testament. Chicago: GW Borland & Co., 1882. Original owned in April 2013 by Brenda Leyndyke, [address for private use], Battle Creek, Michigan. Today, April 15th, is known as "Tax Day" in the United States. It is the day that the Internal Revenue Service says federal income taxes are due. The earliest United States income taxes were collected in 1861. The collected taxes were to help pay for the civil war. United States tax laws have changed many times over the years, starting out as assessments and progressing to personal income taxes. The earlier days required a tax collector and deputy to oversee the tax collection process. My ancestor, Daniel C. Fenn, was a Deputy for Washtenaw County, Michigan. A legal advertisement was published in The True Democrat, a Ypsilanti, Michigan newspaper, dated 13 January 1865. December 1864, to the 7th of January, 1865.
time at the office of the Deputy in Chelsea. My taxes are paid for this past year, are yours? My great grandfather, Johann August Fredrich, his given name, can be found in the following census records. His last name was recorded as Fredrich, Frederick, and Fredrick in the census. Facebook is a web application that can be used to connect with friends, co-workers, and family members. I joined facebook thinking it would be a good way to stay in touch with out-of-state family members. As the months went on, I had a number of first cousins on my list of friends. It wasn't long before I thought it would be a good way to make some family tree connections and, possibly, receive help with researching our shared great grandparents. Our great grandparents, Johann August Fredrick and Louise Fredricke Zastrow are one of my brick walls. I decided the best way to allow others to access the information I had and, hopefully, to add to it-was to create a group, Fredricks Genealogy. Here are a few steps to help you create a facebook group of your own. First, you need to have a facebook page of your own. To sign up for facebook, go to facebook. Once an individual page is created, select "create a group" which is on the left side of your home page. Type in your group name and select privacy settings. I chose open for privacy and haven't had any trouble with it. Choose icon for your group if you want, or you can skip this part. I chose a tree for mine. Your group is now created. Now you can post questions, information, pictures and invite others to join the group. I used a picture of my great grandparents as the group picture. I added other family pictures that I had. In the discussion section, I asked, "Where was August Fredrick born?" Each week, I add other information that I have found: family members, obituaries, gravestone pictures, census records, etc. My Fredricks Genealogy group has given me more than I ever thought imaginable. My cousins have shared family stories and pictures. It is a great place to ask questions and stay in touch with family members. Do you want another way to reach out to family members? Try facebook. The Federation of Genealogical Societies(FGS) is having their yearly conference in Fort Wayne, Indiana in August. I am going, are you? I signed up to become a blog ambassador to help spread the word about this great genealogical education opportunity. Would you like to be a blog ambassador? Sign up at their website to join other genealogists and promote this great conference. 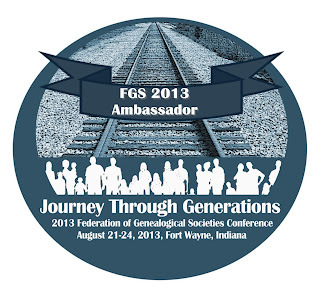 I was a first time attendee at the FGS 2011 genealogy conference in Springfield, Illinois. I remember the excitement of being able to further my genealogical education. I went to the conference expecting just a learning experience, but received so much more than just education at the conference. Here are ten tips for first time attendees. Don't be afraid to ask for help. There are wonderful people willing to help and answer questions for you. Conference check-in and sessions are well staffed. Strike up a conversation with other attendees. Conference attendees are warm, friendly people. I talked to one person from Pennsylvania. She lived in a county where I had Mennonite ancestors. She gave me new resources to explore. Be sure to visit the exhibit hall. I took one session time and used it just for browsing the exhibit hall. It was less crowded and I could take my time exploring the wonderful resources there. Buy early at the exhibit hall. If you see something you like, and want, at the exhibit hall, buy it. I waited to buy a book until the last day and when I went back, it was sold out. It's not scary to be a newbie. I thought I would feel overwhelmed and out of my element when I went to Springfield, but the opposite was true. I had a wonderful, first time experience. Arrive early to well-known speaker's sessions. Classes filled up early and they didn't allow standing room only, in Springfield. Thomas W. Jones and Elizabeth Shown Mills are popular speakers. I am sure there are others but these names come to mind. Leave the conference center and explore. Use one of your lunch times to explore the area around the conference center. See what the locals have to offer. Fort Wayne has the Allen County Public Library Genealogy Center, a must see in Fort Wayne. Attend a social event. If your budget allows it, sign up for a social event or two. You will be seated with others who share your passion for genealogy and great conversations flow. Pack address labels and business cards. Address labels are great to keep you from having to write your contact information on prize drawings, which there are plenty, in the exhibit hall. Even if you don't have a business, business cards are a wonderful way to give your contact information to others. You never know when someone might have that one piece of information that could help you. Be sure to include your email address. Have fun! Take time to enjoy the experience. Talk to people, attend sessions, take pictures, and be social and you will remember your first time forever. Please feel free to contact me with any questions. I look forward to seeing you in Fort Wayne. 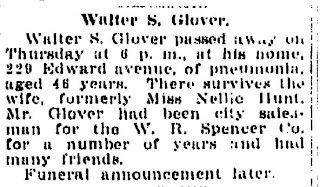 Previously, I shared Muskegon, Michigan newspaper articles about my second great-grandmother's, Adaline L. (Dyer) Glover, membership in the Women's Christian Temperance Union (W.C.T.U.) 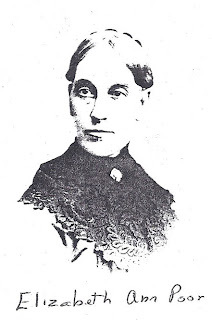 Adaline and her husband, Samuel S. Glover, Jr, were on a committee that called for the arrest of saloon keepers who sold liquor on 4 July 1881. The W.C.T.U believed that selling liquor on the 4th of July was illegal. The saloon keepers were arrested, but were they convicted? "Not Guilty!," Muskegon (Michigan) Chronicle, 14 July 1881, p; column 3; online images, Genealogy Bank (http://www.genealogybank.com/gbnk/newspapers/ : accessed 7 May 2012), Historical Newspapers. case was that of Wm. Bodendorfer. dence returned verdict of not guilty. of testimony or argument rapidly. on the part of the defense to dispute it. Labels: Adaline L. Dyer, Samuel S. Glover Jr, W.C.T.U.